Finncon is organizing an amazing fantasy and science fiction flea market for our guests. We are offering wonderful books, direct from fans to fans! Clean your shelves, earn some money for essentials, and most importantly, put some great literature to circulation. We would like to get fantasy, scifi, horror and other type of speculative fiction. Even small batches will be happily received. You can bring comics, DVDs (no VHS though). You can mix in some mainstream literature and nonfiction, as longs as the main focus is clearly in speculative fiction. You can prize the books yourself. The stall is operated by Finncon, so the seller’s don’t have to spend time behind the desk. Finncon charges the formal 15 cents + 10 % for every sold item, which is used to cover the costs. Book series you can sell in a one bundle, but please mark the price of each individual book in the bundle to all books. Bundles must be tied together with some type of twine or paper tape. Fantasy Flea Market is open like the usual vendor’s tables at Sat 14th July 10 am – 5 pm and Sun 15th July 10 am – 4.30 pm. You can also bring your books already on Fri 13th July from 5 to 6 pm if you like. Sign up as a seller to kirppis@2018.finncon.org. From her you get your seller number. Take the number even if you aren’t sure if you’ll bring anything. We should have enough numbers. Signing up ends at 9th July So be quick! 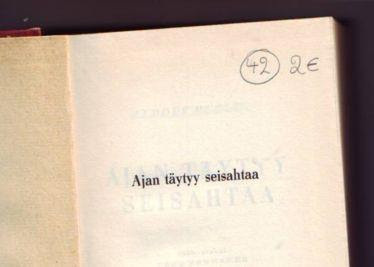 Mark your seller number with pencil and clear hand-writing in your every book, at the first page in the right top corner and remember to circle it. Also add there the price you want from that book. Price you can decide yourself, but use even euros, unless the book costs less than 4, so you can use half euros. For example 2,50 is a good number, but 2,90 isn’t. Notice that if the book doesn’t have the seller number AND price, we can’t sell it. Bring your books to the convention. You can bring them on Friday afternoon from 5 to 6 pm or any time the seller desks are open (Sat 14th July 10 am – 5 pm and Sun 15th July 10 am – 4.30 pm). Remember to reserve the seller number beforehand though! Unsold books can be taken away at any time, but before 4.30 pm on Sunday. Organizers would be happy, if you could come to help at the end of the con by clearing the tables. We must be out of the building before six, so we will be working quickly. 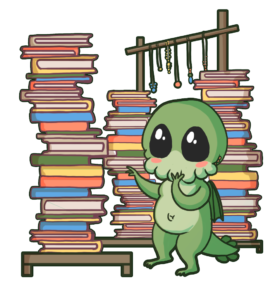 You can donate the unsold books to the Finncon if you wish to do so, they will be put up for sale at the next con (if you do so, please inform us, otherwise we can’t keep them). In the previous flea markets 65–80 % of the books brought have been sold, so taking them back home will be way easier than bringing them. Signing up for Fantasy Flea Market ends at 9th July 2018. So be quick! You can try to sign up later, but we cannot guarantee that there will be any space left. Also if you sign up after the deadline, there will be extra 10 % taken off for the Finncon.